[S]omewhere in the recesses of my mind, this admiring appraisal of the prospective veep's intellect struck a familiar chord. With a quick search, I discovered that, indeed, the same was said of Dan Quayle in 1988. Twenty years ago, The Washington Post reported, "Bush aides, who were getting their first in- depth exposure to Quayle, were impressed by his attention span, the quality of his questions and the facility with which he moved through the agenda." Other parallels stood out as well. Conservatives received Quayle's selection rapturously. L. Brent Bozell pronounced himself "ecstatic," and Jerry Falwell called the surprise pick "a stroke of genius." 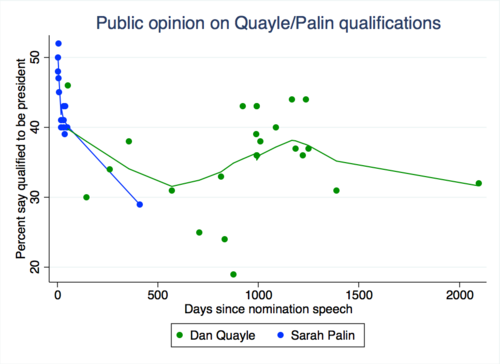 After a media frenzy, Quayle's speech was well-received. The convention hall burst into cheers of "We want Dan!" NBC anchor Tom Brokaw said that Quayle executed "flawlessly," and CBS's Bruce Morton called it "a good speech." Questions about Quayle's readiness remained, but he did his best to turn them into elite condescension toward small-town America. Quayle, in his acceptance speech, spoke movingly about the small towns in Indiana where he had grown up, and he later disparaged Dukakis for "sneer[ing] at common sense advice, Midwestern advice." Today, Quayle is remembered as a disaster. But, during the campaign, his supporters believed that media skepticism of Quayle had rallied ordinary Americans to his side. Dukakis "looks down on his fellow Americans. He looks down on Bush and Dan Quayle as--in his word--'pathetic,'" wrote right-wing columnist Michael Novak. "Thus, the 'feeding frenzy' of the press in New Orleans stirred a national backlash. It united all the scorned of America as one." In short, Palin faces an enormous obstacle in trying to get elected president.